ROYAUME UNI – – Hammerwich - About 90 more pieces of gold and silver believed to belong to the Staffordshire Hoard have been found. The discovery was made by archaeologists in the same Staffordshire field at Hammerwich where 3,500 pieces were found in 2009. Some of the new pieces are fragments that fit with parts of the original hoard of Anglo-Saxon gold and silver. They include a possible helmet cheek piece, a cross shaped mount and an eagle shaped mount. Many items weigh less than a gram, the council said. The items are currently being examined and x-rayed at a laboratory. TURQUIE – Midyat / Sôgutlu ­- An underground city in the southeastern province of Mardin’s Midyat district, which is known to have been used as a settlement in the early period of Christianity, will open to tourists if it is provided allocation. The structure dates back to the early Christianity era and similar ones can be found in the Cappadocia region, Bayar said. “This is more beautiful and bigger, but because of financial problems we cannot restore it. It was used as a sewer system, cesspool and a barn. Some of its parts have been covered with a wall. 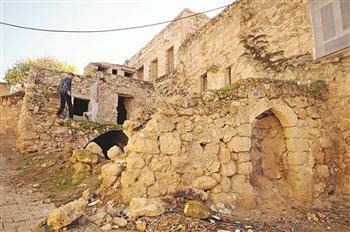 We plan to restore it with a nice project and bring it into Turkish and world tourism. It dates back to the fourth and fifth century, what we call the early Christianity period,” Bayar said. Christians escaping the pressures of Rome used areas of the underground city as both shelter and living spaces, according to Bayar. “In the early Christianity period Rome was under the influence of Pagans before it later recognized Christianity as the official religion. Such underground cities provide security for people and they also performed their prayers there. They are also places to escape. Cisterns, water wells and sewer systems have been in existence since that period. The underground city covers a large part of the district and is so big archaeologists were not able to uncover all parts of the city.” We knew about the existence of this place but did not know about its length. It has two main entrances and one in the north side. We have not reached every part of the city yet. Unfortunately, villagers use some part of the city as animal barn and cesspools. The city covers 80 percent of whole district,” Bayar said. BULGARIE – Sozopol - One of the buildings excavated in the Bulgarian Black Sea town of Sozopol appears to have been a temple to Poseidon, going by the discovery of a large and relatively well-preserved altar to the Greek god. This is according to Bozhidar Dimitrov, director of Bulgaria’s National History Museum.Archaeologists found the building in front of the edieval fortified wall of the seaside town, Dimitrov said. He said that the numerous pieces of marble found during excavations indicate that after the declaration of Christianity as the official religion of the Roman empire in 330 CE, the emperor’s order to destroy the temples of other religions was carried out, followed by the building of houses of worship dedicated to Christian saints, with iconography with features similar to that of the ancient gods. Dimitrov said that in Sozopol, there was an example of how a temple to the Thracian horseman in the centre of the old town was converted into a church dedicated to Saint George. He said, according to a report by local news agency Focus, that in the case of the temple to Poseidon “ the god of the sea “ the time of its destruction saw the building of a Christian church a very short distance away, dedicated to Saint Nicholas, the patron saint of fishermen and sailors.